A whole foods diet plan simply means eating fresh fruits and vegetables that are close to their natural state. This is something beginners need to understand from the get-go. Additionally, minimally processed or cooked fruits, vegetables, nuts, seeds, and whole grains is acceptable. They won’t lose their whole food status. Eating this way means avoiding highly processed foods such as fast food, fried food, baked goods, sugar, and white flour. You need to avoid food that has been refined or otherwise seriously manipulated away from its natural state. When food is whole, it exists physically close to its natural state. This means a whole apple you see in the produce section of your favorite grocery store is a whole food. You can identify it because you have seen apples or pictures of apples as they exist in nature. A whole apple is different than canned, processed applesauce. You still have the same basic ingredients, an apple. But there could be any number of manufacturing processes that turn a nutritious apple into nutrient-poor applesauce. Whole foods are sometimes physically whole, but not always. In other words, you eat a fruit or vegetable without changing its physical shape. You can pull an apple from an apple tree and eat it without processing it in any way. The same is true for an orange or banana. In some cases, minimally processed whole foods still retain their nutritional value. Crushing garlic cloves qualifies as processing that food. This does not, however, keep nutritious and heart-healthy garlic from being considered a whole food. So here’s what you need to know when you start eating whole foods. Eating whole foods means you mostly eat plant-based foods. You may also eat healthy meat and seafood; grass-fed beef, organic, free-range poultry, and wild-caught fish. The idea is simply to eat foods which have a minimal number of ingredients and have been minimally processed. They deliver natural nutrients and minerals rather than additives, toxins, preservatives, steroids, antibiotics, and other “nonfood” ingredients. Going back to the previously mentioned apple, you can easily make your own healthy applesauce. You just need to run several apples through a food processor. This is almost always going to be better than choosing a canned and processed applesauce alternative. Human beings should eat clean, plant-based foods at mealtime. And minimally processed foods are fine. It wasn’t until the 20th century that we introduced processed foods into our diet. Does this mean you can never eat anything that has been processed? No, of course that’s not the case. You just need to be picky about the processed foods you choose. For example, eating highly processed foods such as fast foods all day long just harms you in the long run. What’s the point in doing that? On the other hand, you really don’t want to give up your coffee. That’s fine, don’t give it up. You know you can’t eat or drink raw coffee beans; processing the coffee bean is a must. This makes it possible for you to make the coffee you love. The health rewards come fast and furious when you eat healthy, whole foods. You effectively treat many health conditions you experience when you adopt a whole foods diet. This only makes sense. When you give any engine the proper fuel, it runs properly. If you put diesel fuel into a car intended to run on unleaded fuel, your car will perform poorly. You will eventually damage the engine. The same happens to your body’s engine if you continue to feed yourself nothing but highly processed foods. When you eat whole foods you are giving your body the fuel it needs; the fuel it requires. The result is that you become healthier. Your body starts working like it should, inside and out. Your mind does as well. You will experience fewer emotional ups and downs and more emotional stability. Your stress levels may plummet, as well. Every time you drive past your favorite fast food joint, your heart will breathe a sigh of relief. Skip the drive-thru window and it will thank you, and reward you, for giving it a pass. Aside from lowering your risk of developing heart disease, you limit the chances you will develop diabetes. You can also lose excess body weight and experience improved mental function. You will develop younger looking, stronger, healthier hair and skin over time. These are some of the benefits you can look forward to. This is what you can look forward to when you eat fresh fruits, vegetables, and nuts most of the time. You also need to know that plant-based eating can sometimes cause you to miss out on much needed protein. And make no mistake; you must consume appropriate amounts of quality protein daily. And animal-based protein is your best source. Our earliest ancestors did not sit around the campfire eating brontosaurus burgers and saber-toothed tiger steaks every night for dinner. They were opportunistic eaters, and they ate meat when they could. I suspect no one refused meat at dinner time when it was available. But make no mistake, their diet consisted primarily of plant-based foods. You should not completely remove animal-based protein from your diet, either. They may not have known that protein is essential for your body to function properly, but you do. Every cell in your body needs protein to live and to repair itself. If you enjoy a smart plant-based, whole foods diet, you can get all the protein you need. However, it’s common for people who switch to a healthy plant-based eating regimen to totally rule out animal-based proteins. This is a mistake… don’t throw the baby out with the bathwater. Lean meat, healthy poultry, and certain seafood have many times more protein per serving than vegetables. This is simply a fact of nature. 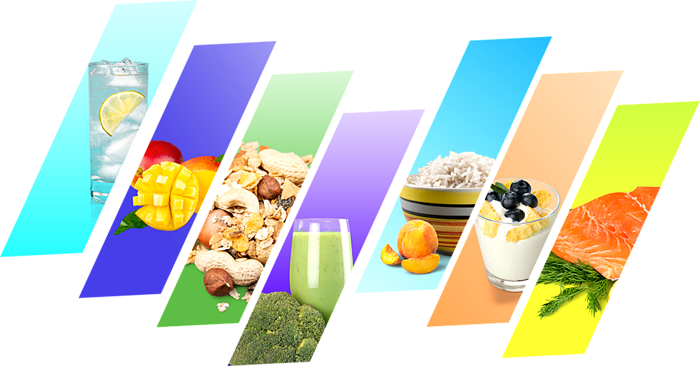 You need protein and carbohydrates for energy to fuel everything you do. You get carbohydrates in some vegetables and fruits, and protein as well. However, nothing beats animal-based food for delivering significantly high levels of protein. You need to consume somewhere between 50 and 130 grams (g) of protein each day. This number depends on your physical makeup, your age, how active you are, and other parameters. If you eat a 9oz ribeye steak, for example, you will eat between 65 and 70 grams of protein. This accounts for 50% to 140% of your daily recommended protein allotment. This doesn’t mean you should include tons of animal-based proteins in your whole foods meal plan. 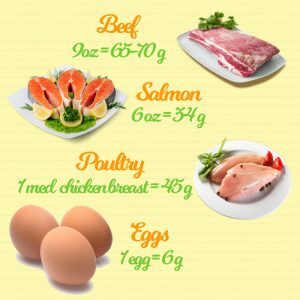 If you don’t like beef or fish, you can still get plenty of protein by including poultry and eggs. These protein-packed foods are also good for you. A single large egg offers 6 g protein. Just 1 cup of chopped or diced chicken breast is good for 43 g of protein. A 3oz chicken breast is worth 19 g of protein. A medium sized whole chicken breast (approx. 150g) would contain around 45 g of protein. Just be sure you are eating the right types of these animal-based proteins. Your beef should always be grass fed. Pasture-raised poultry should be your goal; they should eat a natural diet instead of corn and grain. And you should look for wild-caught fish rather than farm-raised. The Dietary Reference Intakes (DRI) calculator will help you determine how much protein you need to consume on a daily basis. Eating whole foods is a simple concept: eat plant-based foods with a “healthy” dose of animal-based protein. Whatever you decide about protein, just make sure you’re getting enough (even more) of your daily requirements. And make sure your protein comes from a “good” source. Choose the cleanest, healthiest types of eggs and poultry, beef and fish, to give your body the protein it needs. In return it gives you overall health and wellness throughout your lifetime. Ditch the processed foods, fast foods (a fast-track to poor health), and sugars. You will be doing yourself a favor and, in a short period of time, you won’t even miss them. I know; I dumped the junk because I had to. And I don’t miss it one bit.